Course Duration: Bachelor of Library and Information Science [B.Lib.I.Sc] is 1 Years. Duration Course Duration of Bachelor of Library and Information Science [B.Lib.I.Sc] is 1 Years. Employment Roles Librarian, Assistant Librarian, Technical Writer, Library Assistant, Assistant Professor - Postsecondary / Higher Education etc. Placement Opportunities Private Libraries, Public Libraries, Libraries in Schools and Colleges. The Bachelor of Library and Information Science duration is one year where the Individual will be acknowledging the knowledge regarding the Library functions and its backend applications for Information Science. B.Lib full form is Bachelor of Library and Information Science. It is also abbreviated as B.Lib.I.Sc. or simply BLIS course. It is an undergraduate Library Science course. Chhatrapati Sahu Ji Maharaja University, Kanpur etc stand among the top Bachelor of Library and Information Science colleges in India. Library and Information Science is associated with schools of library and information science. Bachelor of Library and Information Science eligibility criteria is to take students on the basis of merit with a minimum of 50% marks or 55% marks on the 10+2 basis from a recognized board. Library science is a social science incorporating the humanities, law and applied science and studying topics related to libraries; the collection, organization, and the political economy of information. Information science is a science primarily concerned with the collection, classification, manipulation, storage, retrieval and dissemination of information. The course is of widespread value as the B.Lib.I.Sc jobs offer many opportunities to the candidates after its successful completion. 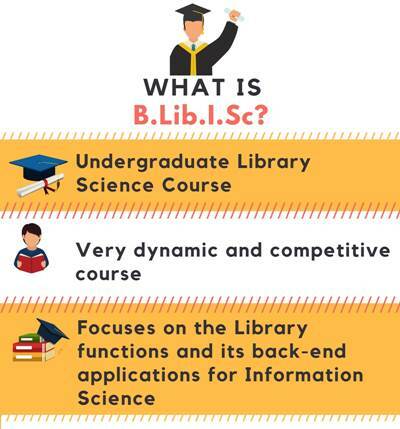 What is Bachelor of Library and Information Science [B.Lib.I.Sc]? The one-year BLIS course educates an individual regarding the dynamics and work ethics of the Library and uses of Information Science on the same. Library Administration etc is enforced in the B.Lib.I.Sc syllabus. 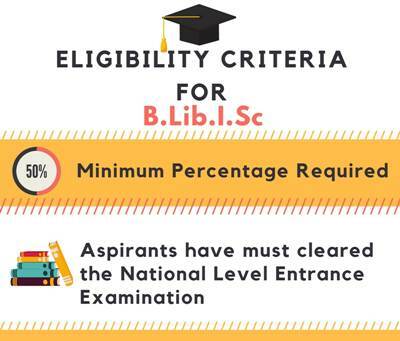 The Bachelor of Library and Information Science eligibility criteria are to complete the (10+2) Secondary and Higher Secondary Schooling from a recognized board. Working in some of the elite places like Governmental embassy's across the globe and operating as some of the finest professionals in the world will be a major factor that will attract an individual to opt for the B.Lib course. 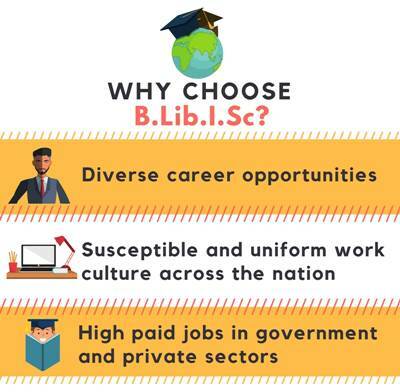 Why Choose Bachelor of Library and Information Science [B.Lib.I.Sc]? Books are the imperial source of knowledge in terms of History, Literature, Demographics, and others. But working in the dynamic and contemporary applications of the same is some of the responsibility for a Bachelor of Library and Information Science [B.Lib] professional. 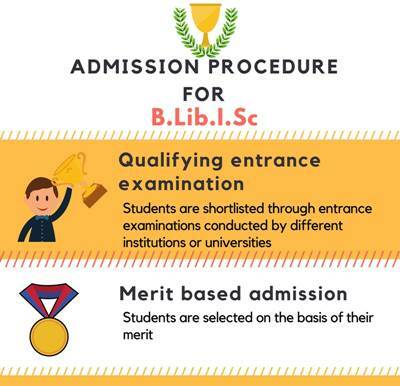 After the completion of B.Lib course duration, one is eligible for higher studies like M.Lib.I.Sc, M.Phil, and Ph.D. after which one can be hired as a professor/lecturer in a reputed college/university. Working as Librarian in some of the finest Libraries like British Library, London; Library of Parliament and other global and Historic book palaces are some of the work opportunities one can be offered post-graduation. Individuals can also choose to be a Writer or Author, which will definitely add some artistic value in the comprehension of their experience. Candidates should have a Bachelor's Degree in any discipline from a recognized university board. Candidates should also secure a minimum of 50-55% in the last qualifying degree to get admission for this course. The admission procedure may vary from institute to institute, some of the institutes intake students on the basis of their merit by preparing a cut-off list for the selected candidates. There are few colleges which conduct their own entrance exam for the filtration of the students who have applied for the course. But most of the colleges in India consider the marks of 10+2 for admission to the course. The candidate can apply for the course through online or offline mode to the respective university. The candidate may be called in for a personal interview before admission. Generally, the application process starts after the universities have released their bachelor's results and the candidate must have 50% marks in graduate level. The B.Lib course fees varies from institution to institution. Where some institutions charge around INR 5000/- per annum, others may charge INR 20,000/- per annum. It is very famous college in our locality. I have an entrance exam for admission in calls 11th and then I got selected having a good cutoff marks 84 out for 100. If I have 50% marks in 12th standard then I can take direct admission for this degree.